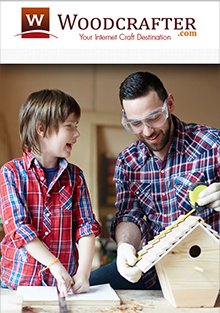 A world of wood craft projects, arts and crafts materials and supplies, from your online wood craft store, Woodcrafter.com. Your discount will be automatically applied at checkout on the Woodcrafter.com website. Wood craft projects - From birdhouses to boxes, stars to stencils, Woodcrafter.com is your ultimate internet craft destination, the online wood craft store that provides you with all of the wood crafts supplies you need to create a wondrous wood craft masterpiece. No matter what kind of wood craft project you're taking on, you'll find the tools, parts and supplies that will serve both amateur woodcrafters and experts alike. Wood crafts supplies - Shop Woodcrafter.com's crafting corner online for hundreds of essential wooden crafts supplies including painted or unpainted wood cutouts and shapes, wood parts, artists tools, paint and brushes, glue and glue guns, sealers, finishes, ball knobs and handles, hardware, pegs and more wood craft project staples. Wooden crafts for kids - Kids will love learning how to create their own wood craft projects at home or at school with wooden crafts that are designed especially for them. Stock up on blackboards, boxes, doll parts, wood pencil houses, seasonal wooden craft ornaments for the holidays, picture frames, Woodsies colored shapes and craft sticks and more wood arts and crafts products that will bring your child endless hours of enjoyment. Wooden crafts parts - Discover wooden parts that will help you follow through with dozens of cool and crafty applications. Find wood turnings and various woodworking shapes for multiple wood craft projects, plus unfinished wood spools and spindles, finials, dowels, wooden plugs, beads, buttons, blocks, balls and cubes as well as wooden doll parts, bird toy parts and hundreds of other practical parts for all of your wood crafting endeavors. Since 1996, Woodcrafter.com has strived to bring woodcrafters the quality products that are essential in making each and every wood craft project a success. Whether you're crafting wooden toys or painting paper mache, you'll find a wood crafting paradise waiting for you online at Woodcrafter's wood craft store.